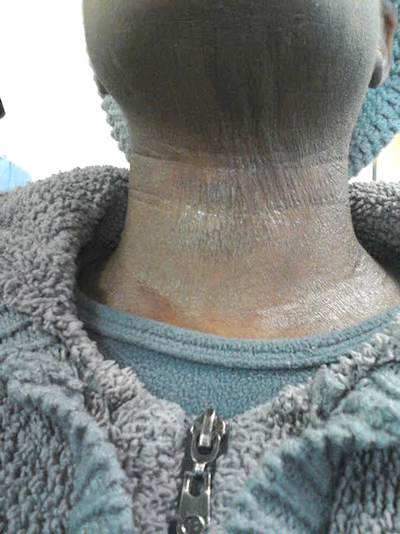 Okay, I don’t know if this has happened to any of you TSW Warriors, but my neck (yes I am talking about my neck again) decided to start itching like mad today, right in the front of it. So instead of using my finger nails (hands were covered up with latex free rubber gloves anyway) I used a paper towel. After I gave it a nice hard swipe or two, a bunch of skin came off on it and some weird looking sticky stuff. I was at work when this happened. So, I went back to doing my work but 10 minutes later I heard a weird little hiss (or perhaps one of my co-workers popped off gas, but I don’t think so) sound, my neck felt all wet and then I felt something drip down onto my chest. I immediately looked in the mirror I had on my desk and the front of my neck was all wet and juicy. I even saw a trail of ooze flowing down from the middle of it…a LOT of ooze. This scared me half to death and alarmed my co-workers too when I let out a yelp of some sort followed by a loud, “This is NOT happening!” I grabbed some more paper towel to soak up the ooze and I mean, it was like someone shot me full force with a water gun aimed at my neck. It was THAT serious. I then had to break for the bathroom and get some more paper towels. I literally had to wrap it around my neck and cover it all up with my scarf before I left for home today. I felt kind of nauseated as well AND grossed the heck out! Think I had a bit of an Anxiety attack. I swear, I wouldn’t wish this mess on my worst enemy.